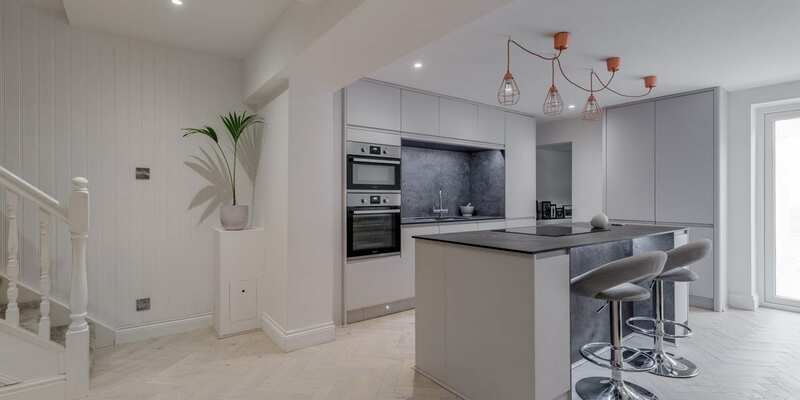 White Island Sand’s light muted tones, reminiscent of an idyllic beach scene, were the perfect choice for this modern family home located in the Cornwall town of Saltash. Ricky and Natalia moved into the riverside home in the small town of Saltash, often referred to as ‘the gateway to Cornwall’, two years ago. They were in the market for a waterside property and when this 1840’s terraced cottage came on the market they snapped it up. Ricky explains, “Location was key. Water sports are a huge passion for us and the homes location was just fantastic. Situated on the River Tamar the views from the front of the house look directly over the expansive river so we can enjoy our love for paddle boarding and kayaking directly from our front door. With plans in place they instructed a builder to start this part of the project first and began to think about preferred interior styles for the space. 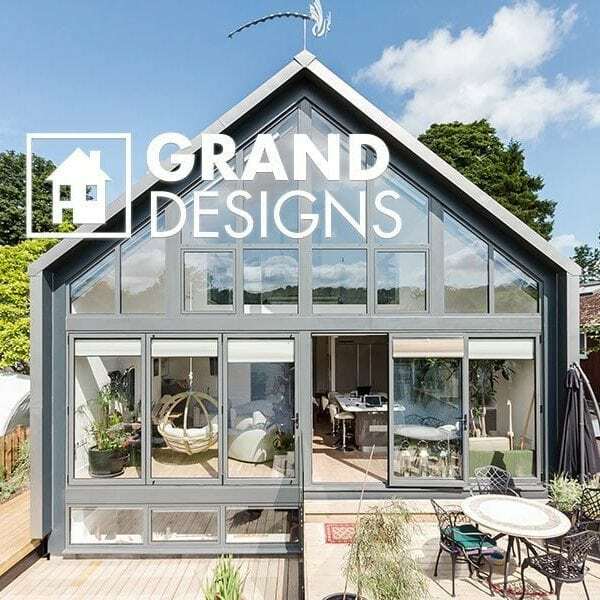 “We knew we wanted to keep the interior light and modern, creating a lovely flow and feeling of space that would lead naturally through the home and out to the garden. 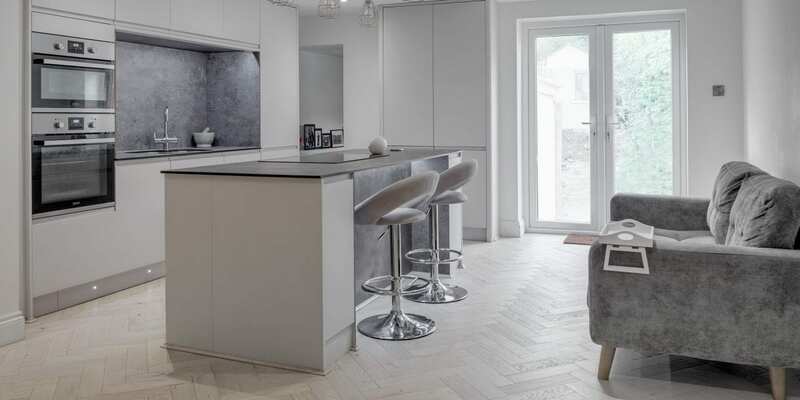 Opting for tall units to maximise space and simple natural grey surface finishes to add some tone and texture and mirror the surrounding landscape, the couple also added pendant lights from IKEA to create a lighting feature over the kitchen island. 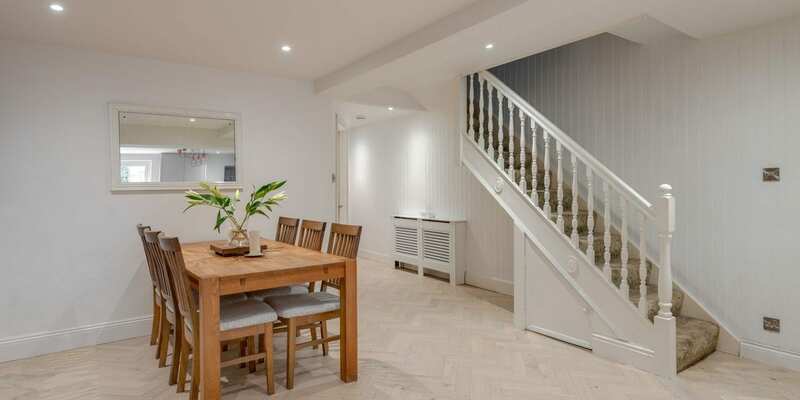 “With the build and kitchen well under way we turned our attention to the flooring. We were keen to run the same flooring from the front door to the back door, flowing through new open plan family room. 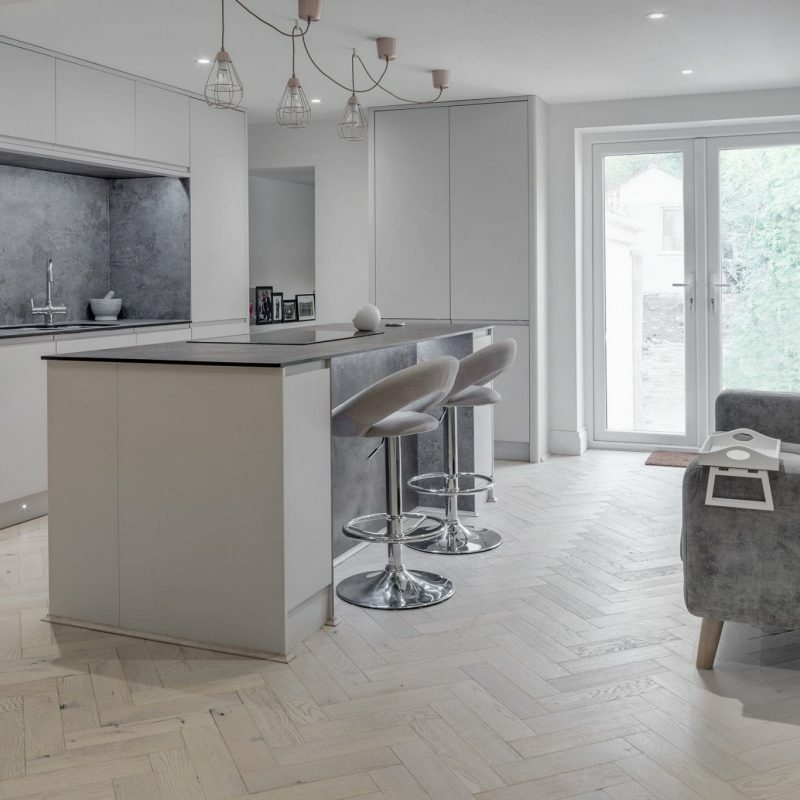 We loved the idea of herringbone wood floors – we’d seen lots of lovely interiors online with this style of floor and were keen to have something similar. “A friend of the family is a carpenter and he said he’d be happy to work with us to install our chosen floor. 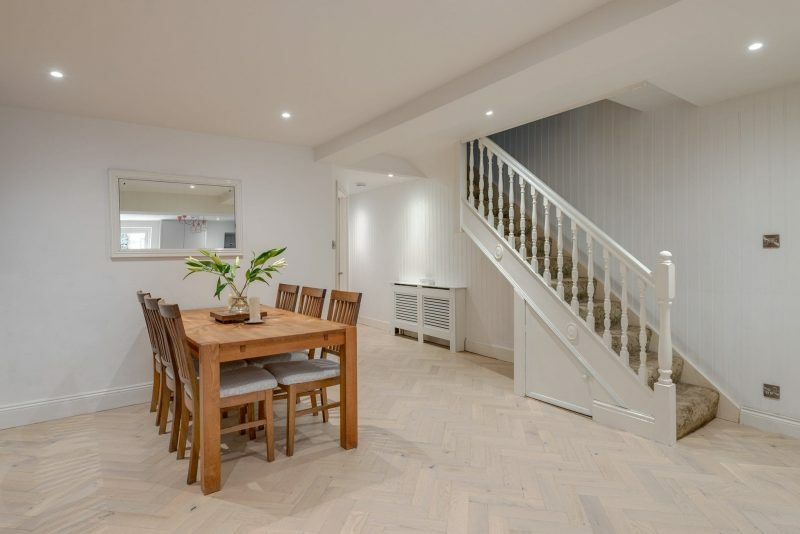 We asked him for advice on herringbone options and he suggested we take a look at V4’s Zigzag collection as the oak blocks are really versatile to lay, great quality and come in a lovely choice of colour finishes. He also mentioned the floor would last a lifetime if properly maintained. With the floors ordered from V4 approved retailer Country Coverings, once the main building work was complete a sound ply surface was in place, leaving just a small amount of levelling work required to prepare the subfloors ahead of the oak blocks being installed. 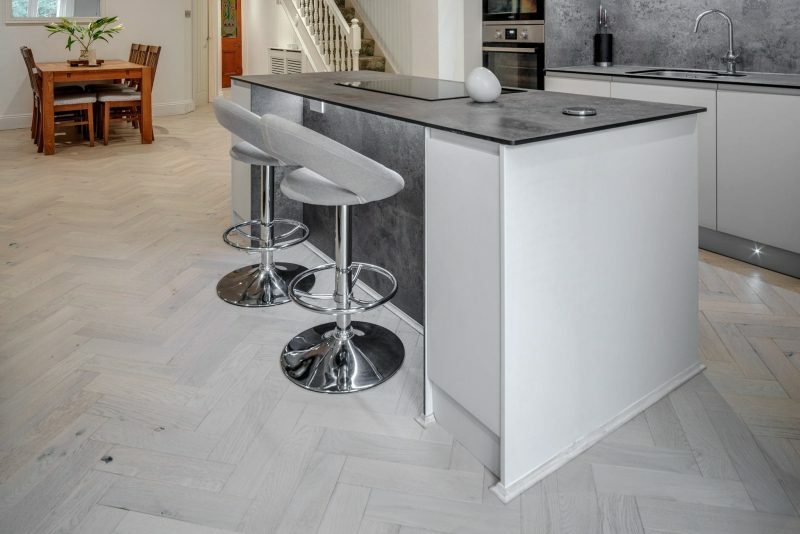 Zigzag’s engineered blocks feature a simple tongue and groove profile for quick and easy installation. 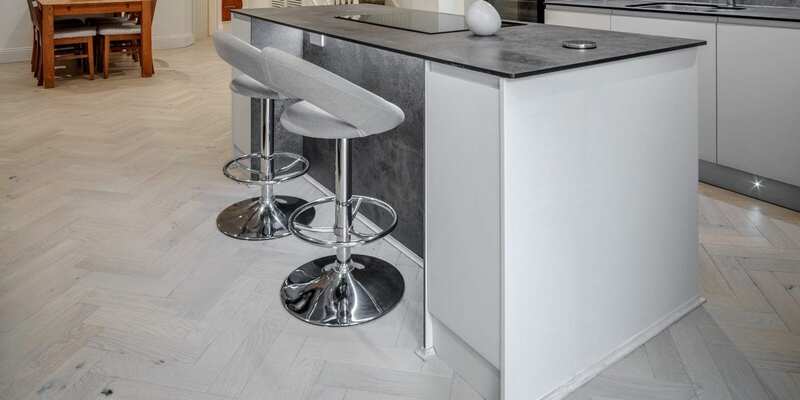 The textured oak surface is brushed and stained white with a natural pigment which allows the natural grain and variation to shine through the light White Island Sand finish. This floor is then sealed with a durable natural lacquer. 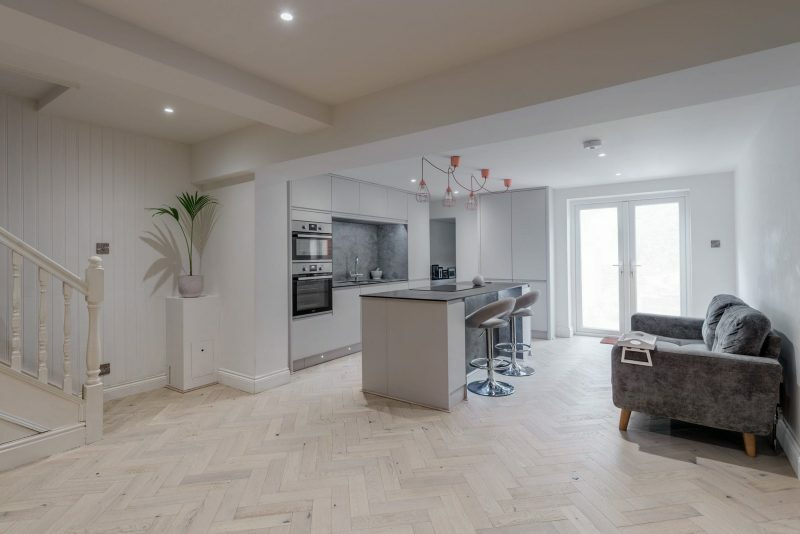 Unlike traditional parquet blocks the Zigzag range of floors are engineered with a 4mm oak wear layer with bevelled edges applied over a hardwood ply base, which means they can be bonded to any flat surface including over low energy underfloor heating systems. 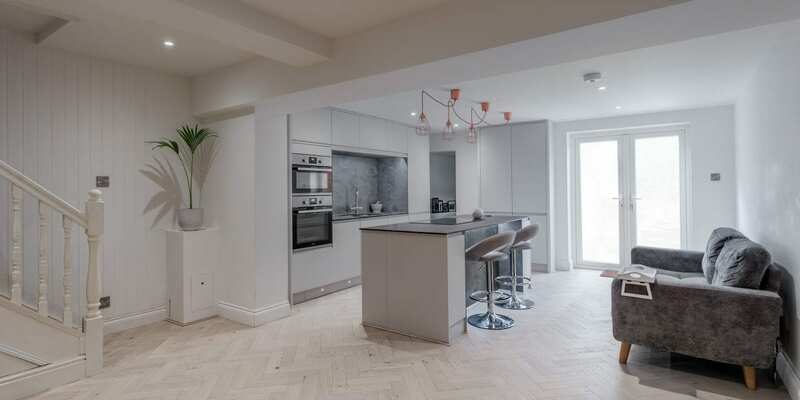 Installation of the floors throughout the hall and extended kitchen and living space took just a few days and the couple are delighted with the results. 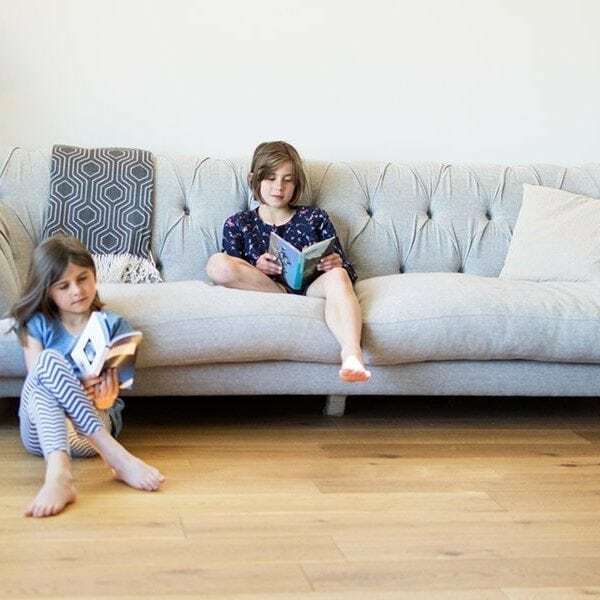 “We absolutely love the wood floors, they are so in keeping with the interior style of our home and the light, muted effect is exactly what we imagined when we saw the samples. They really suit our love of being by the water with the white and bright sand like appearance they convey. 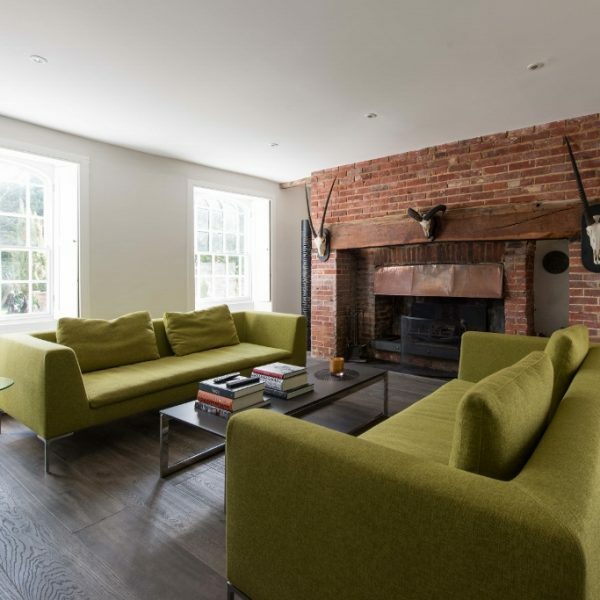 “During the build our baby came along to add to the chaos, but with our lovely spacious family room now complete we can start to enjoy it as a family. 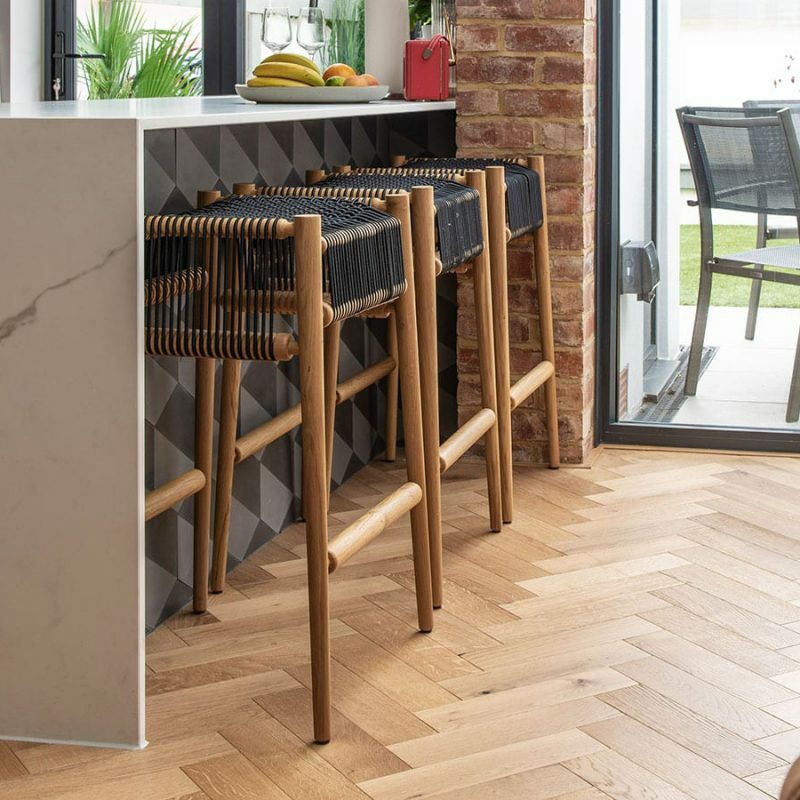 It’s also a great space for entertaining and visitors always comment on how much they love the floors as they have such a beautiful soft tone.